Kiyomi and Maya met in the fifth grade and became fast friends, and I was immediately so impressed with her – so fearless and unique. And I liked her mother Polly as well – unpretentious and honest, with the easy parenting style of someone with four children. I remember one day when Maya was at our house and she fell and hit her head. I handled it in my usual way – screaming for an ice pack, frantically grabbing the phone to call 911 and then packing my bags to turn myself in to Child Services. I finally got a hold of myself, though, and when Polly came over she just rubbed the back of Maya's head, calmly asked her if she was okay and said, "She's going to be fine. My kids have sturdy heads." Just like that! I remember being so admiring of that calmness and levelheadedness. Two weeks ago this beautiful family lost Eitan, 14, in an early-morning fire that gutted their home. Their loss is unimaginable, but the family has handled it with such strength and grace. Many of you have asked how you can help, and I wanted to let you know that there will be a memorial fundraiser for Eitan and his family on Sunday, August 29 at the Improv in Hollywood. Eitan was an aspiring actor and had performed in several stand-up shows for teens – there is no doubt he had talent beyond his years. You can find information on the fundraiser HERE. Here's a video that Kiyomi and Maya made a few days ago. I think Eitan would have approved. 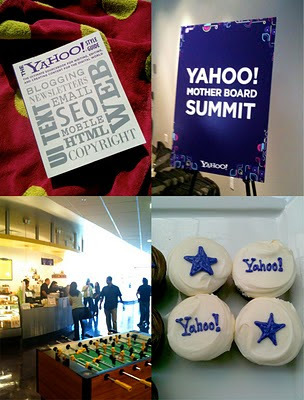 A few weeks ago I was whisked away by Yahoo! to the first ever Motherboard Summit and spent a few days learning, socializing, and eating topped off by a night of karaoke where I may or may not have done some things I'll regret if I ever run for office. Oh, and I spoke on a panel in front of a room full of people and didn't pass out or scratch myself inappropriately.